23321 SW Bosky Dell Ln. Whether you own property with eroding slopes, fish, swim or raft in Oregon streams, or enjoy viewing wildlife dependent on healthy watersheds, you have a steak in erosion control efforts throughout the Pacific Northwest. Silt and soil run-off threaten watershed health throughout the Willamette Valley wherever logging or development impacts our land. Landowners experience economic loss from erosion of land on waterways, the cost of water filtration in cities is increasing, harbors are experiencing increased expenses for dredging projects, and fish and wildlife habitat is compromised by erosion in our watersheds. It is simple to be part of the solution to erosion problems in Oregon. Three important rules to plant by if you want to prevent erosion on your property or on large scale land reclamation or developement projects: 1. Plant natives, which are adapted to our climate and rainfall patterns and are pest and disease resistant. If you choose the right native for your site, it can survive without irrigation. Irrigating a slope already saturated is a sure-fire recipe for erosion. 2. Plan for a variety of root structures. Lace your soil with a supporting web of roots of varying depths. 3. Plan for a variety of plant structures. Giving consideration to sun, shade and soil, plant ground covers, trees and understory shrubs. 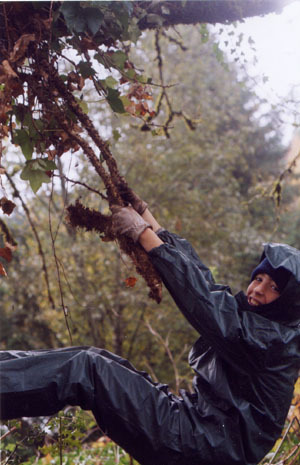 It should be noted that ivy, that all-too-common erosion remedy, turns out to be no remedy at all. It meets none of the requirements detailed above. It is non-native, creating a monoculture as it spreads and smothers neighboring plants, leaving vast swaths with only one root depth. Those roots are shallow, and ivy tends to slough off in large sheets. Ivy also favors our native deciduous trees as climbing posts to reach the sun. Once up in our maples and alders, it branches out like a shrub, weighs down trees accustomed to leafless lightness in winter, and then weakens the trees further through loss of light from the blanketing ivy. These trees are ripe for harvesting by the next high wind. 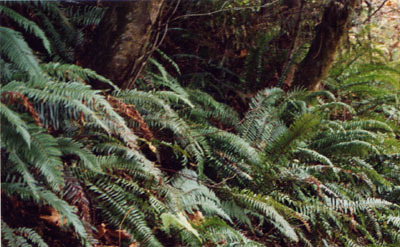 Among our best natives for erosion control, sword fern has deep, strong roots, is readily available and easy to establish. Plant it in clumps, ribbon in native strawberries and yarrow. Vancouveria is another good ground cover choice. 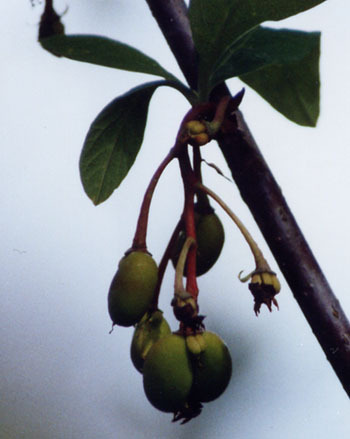 Fast growing, its leaves hold late, turning a lovely yellow in fall and early winter. 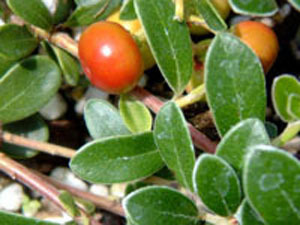 Choice shrubs include redtwig dogwood, snowberry, elderberry, thimbleberry, salal and oceanspray. Indian plum is another good shrub for erosion control, and it has the added benefit of luminous, graceful white flowers that bloom before just about everything else in the spring. Trees that can work well on slopes include western red cedar, Douglas fir, and madrone, among others. Before planting a slope, know it. Look for sources of water runoff, such as gutters or driveways draining on it, and reroute the water. If the slope is already destabilized, your efforts won't save it. Check for cracks along the top. These are signs that the slope is going to fail. If you find those, you should call a professional.